Tau cheo (豆酱) is a fermented soy bean paste made from yellow soy beans. It is very salty, slightly smoky, and slightly yeasty – a flavour that regular salt cannot give. Because it is so salty, it is used sparingly or when used in large amounts, sugar will be added to balance out the saltiness. 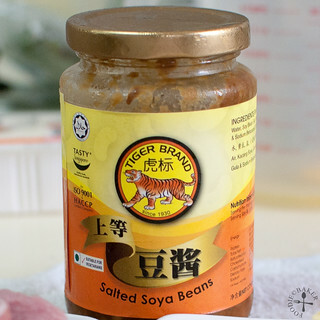 There are 3 types of tau cheo available in the market – whole beans, slightly mashed and fully pureed. It depends on your recipe needs, but my mom will always get the slightly mashed ones because you can just use it as it is and whenever you need a pureed one just mash the ones you have – this way you don’t have to get 2 bottles of tau cheo. Once opened, the tau cheo is stored in the refrigerator and it lasts really well. Taucheo is used in a lot of Asian dishes – vegetable stir frys, stew pork, tofu etc. 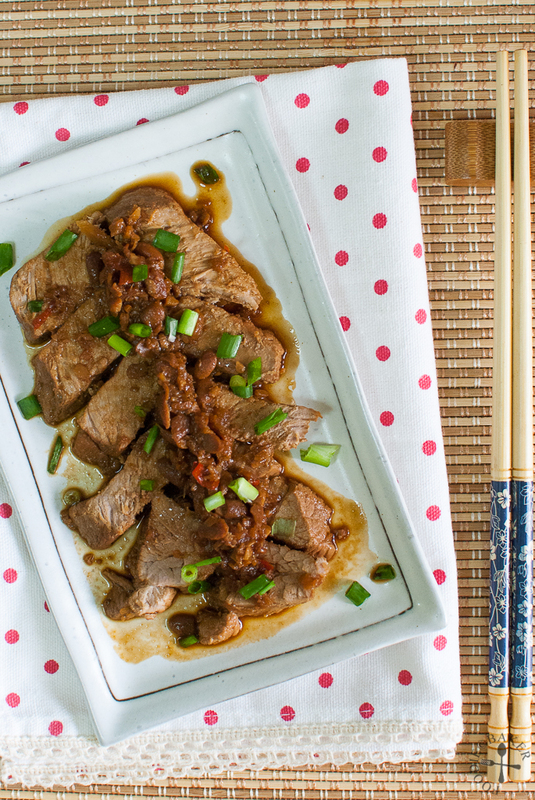 Today I’m sharing a recipe that uses pork to pair with tau cheo. Without consulting my mom, I went to get the cut of meat that was on sale – pork hind leg and boy how I regret it! 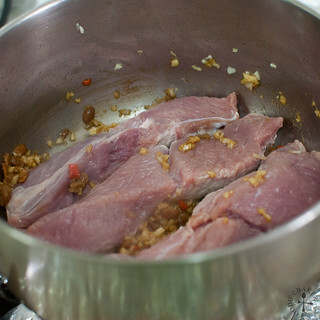 Pork hind leg contains very little fat and the meat was rather stringy and dry even after 1 hour of stewing. So in the recipe I’ve noted to use pork belly, pork fillet (tenderloin) or pork ribs for the recipe. I will definitely opt for pork belly the next time I make this! Here are the step-by-step photos if you feel like trying out this recipe! 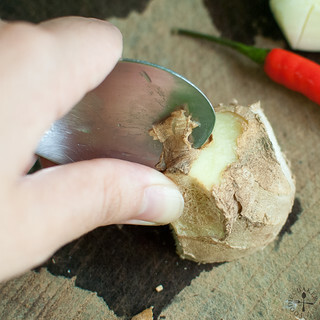 1) The bean paste that I'm using 2) Peeling ginger with a spoon - an easy method! 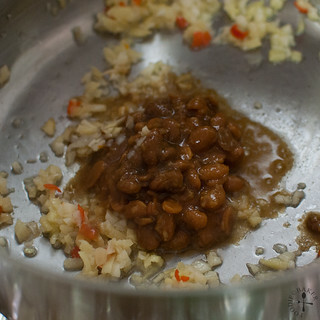 3) Frying the aromatics and tau cheo. 4) Adding the pork. 5) Followed by water. 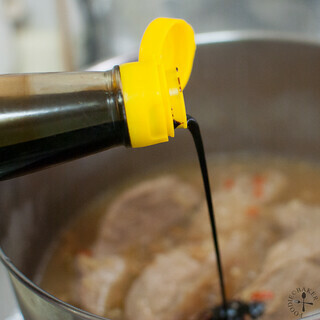 6) Dark soy sauce for colour and then simmer away! Best served with a bowl of rice! 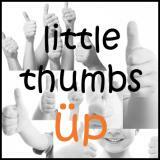 I’m submitting this to Little Thumbs Up organised by Doreen from my little favourite DIY and Zoe from Bake for Happy Kids. This month’s theme is Soy – hosted by Mich from Piece of Cake. The recipes are all linked at this post! Heat oil over medium-low heat in a pot. Add in garlic, ginger and chilli and fry, stirring continuously, until you can smell the fragrance, a couple of minutes. Don't let the mixture burns! If it burns, start over. Add in the tau cheo and sugar and fry for a few more minutes then add in the pork, browning the sides a little. 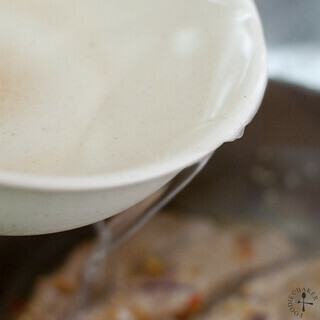 Add in water until ¾ up the pork and bring to a boil. Add in dark soy sauce. Cover and simmer for 30 to 45 minutes until the meat is tender. Taste the sauce and if it's too salty, add more sugar. 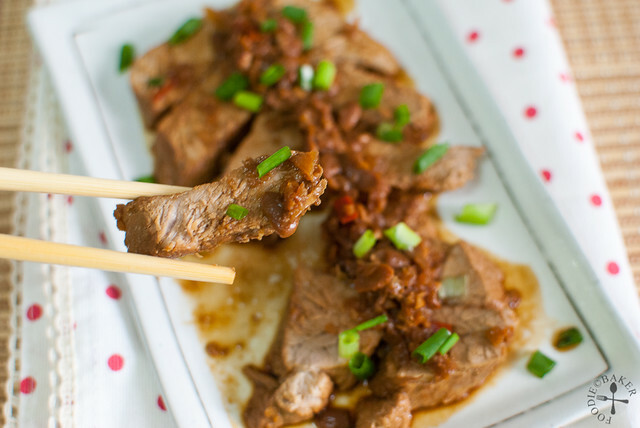 Slice the pork into thick chunks and transfer onto a serving plate. Scoop the sauce on top, garnish with chopped spring onions and serve. Didn’t know that peeling a ginger with a spoon is easier than using a knife… mountain tortoise me! Your tau cheo pork looks delicious! 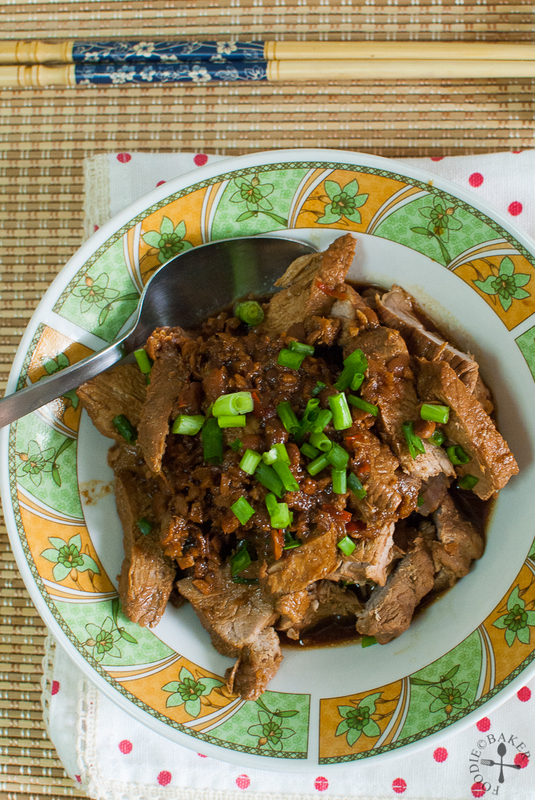 Your tau cheong pork is totally mouth watering! Now I need to run out and buy some teau cheong. You may not be happy with the cut you selected, Jasline, but the dish looks beautifully prepared. You’ve a real skill in presentation. I’ve a question. When you say you’d like to prepare this again with pork belly, how would that be cut? 1 large piece, thin slices, or rectangular chunks? Hi John, thank you for the sweet compliments! My mom has always been braising the pork whole until tender before slicing it, so I will most likely do the same. If they are too huge to fit the pot then I’d divide them into large chunks. I’m not sure what will be the difference if I choose to slice first then braise them, do you have any idea? my mom does the ginger peeling with the back of a knife, but thanks for the spoon tip! love taucheo and i’m sure this dish tastes awesome, esp with ginger! What a tasty looking pork dish! Wow! That looks lovely, I love this very homey dish which I enjoyed alot during my childhood days. This dish must be very delicious. I love the flavour of tau cheo especially with ginger. Hi Jasline, simple and lovely. Kind of dish which I love to prepare. This post reminds me of a bottle of tau cheow i have somewhere in my pantry! this seems like a good dish to put that into use!